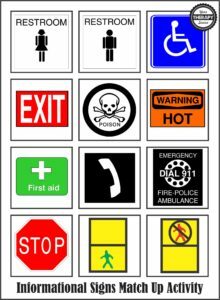 Try this matching game of important signs. Print out two copies of the signs. Cut out one copy into cards. Create a file folder game. Cut out both copies and play memory with the cards. This is a great functional task. 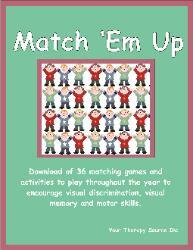 Download of an electronic book of 36 matching boards that promote visual discrimination, visual memory and motor skills. FIND OUT MORE INFORMATION.